Display up to date financial information with Finance Apps. 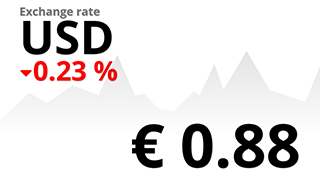 Keep your audience informed of currency exchange rates and variations. Go to the Apps Library (How to Add Apps). Single Exchange Rate: This App's name makes it clear what it is about. 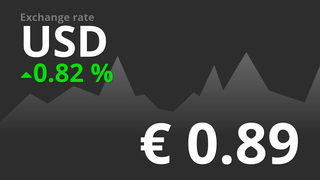 It shows the exchange rate between two currencies and their daily variation. Select the base currency and the currency exchange rate you want to display. This App is available in light and dark color scheme. Multi-currency exchange rate: In the same style and color of the previous one, this application displays as many exchange currencies as you wish in slideshows with transition effect. The currency abbreviation is written on the left, then comes the price in the base currency and the daily variation. It is perfect for bar areas on your screen. Similar is the Currency Exchange Scroller which as the name says has the exchange rates run over the screen. 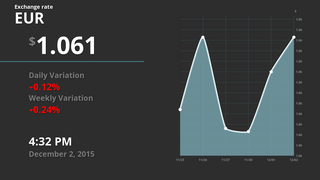 7 days exchange rate: Exhibit a short seven day history graph alongside the current currency exchange rate. This App also displays the daily and weekly variation in percentage. The graph adapts to different screen zones, so feel free to place it where it fits best. A recommendation is to display it in the footage, along newsfeed. Learn here how to use Newsfeed Apps. 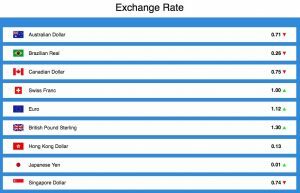 Exchange Rate Table: A new layout is the Exchange Rate Table which allows you to display up to 10 exchange rates to a base rate in table form at once. Perfect for banks and money exchanges. Select the currencies and color scheme in the App’s settings and click on “Save”. The custom App is saved in your App folder in the Content Library and ready to be set on campaigns.